David Cronenberg has quietly built an canon of amazing cinema throughout his directing career, one that has me captivated since I was a little boy including Dead Ringers, M. Butterfly, Naked Lunch, Videodrome and History of Violence. When I was about 7 years old my cousins thought to get me into horror films and one of the first films they showed me was Cronenberg's Scanners. The next film I saw of his is still one of my all time favorites, The Dead Zone. After seeing The Dead Zone, anything Cronenberg had directed or would direct I was most definitely going to see. In particular, I remember begging my dad to take me to see The Fly in 1986 at 9 years old. He did and we loved it! 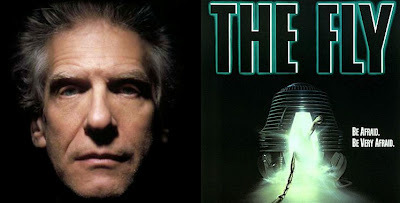 If anyone is going to remake it and improve upon it, Cronenberg does seem like the perfect fit. He has recently helped re-envision his version of The Fly into a opera to marginal success. Technology itself has changed entirely since Cronenberg had directed the film back in 1985 and having today's abilities with Cronenberg back in the director's chair has me more excited than I would be if anyone else was directing. Cronenberg also wouldn't be the first director to remake one of his own, but the huge question is can Cronenberg find another Brundle as powerful as Jeff Goldblum was in the 1986 version? Goldblum could potentially return and have a go at a re-do as well (although, I highly doubt Goldblum would).